1) The Warmbiz Heated Bra: No Chest Colds Here! 2) The Voter Turnout Liftup Bra: Got an Election? Politics is boring, especially in Japan where consensus is king. Leave it to triumph to spice things up with The Voter Turnout Liftup Bra! 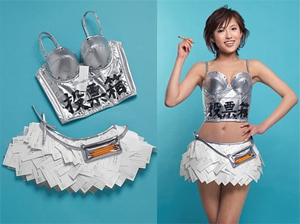 Crafted of silver vinyl, the bra is boldly labeled "ballot box" while the matching skirt is made from ballots. Vote early and often! Look out for paper cuts! It's called the "Total Surprise Bra", and I have no idea why. Supposedly the catchy red bustier worn so appealingly by model Yu Misaki was designed to bring attention to previous Prime Minister Koizumi's post office privatization plans. Who?? What?? Exactly... so the bra can only help, right? 5) The Anti-smoking Bra: No Butts Allowed! According to the creative crew at Triumph, The Anti-smoking Bra "emits a mysterious fragrance designed to kill the desire to smoke." Perhaps the jaw-dropping effect of the bra itself is what really does the trick, however. Is there really a fragrance that turns off the addictive effects of nicotine? Do you really care? The "My Chopsticks" Bra is a tasty little treat that features miso soup and rice bowl cups separated by a chopstick rest. Tucked into one shoulder strap is a pair of collapsible, portable chopsticks. The aim of this appetizing ensemble is to bring awareness to the environmental effects of wood disposable chopsticks. Ok, we're aware... can we eat now? 7) The Birth Rate Decline Bra: Granny sez Make More Babies! Japan has one of the world's most rapidly aging populations and once the average age hits 70, who's going to model Triumph's bizarre bras - or want to look at the models? Thus, The Birth Rate Decline Bra, festooned with cartoon grandmothers admonishing lazy Japanese to get down, get funky and get themselves some families. Sorry Triumph, the only thing this bra is going to increase is the staying power of the men who have to look at it. Is Triumph giving us mixed messages? First it's like "get intimate", now it's all "lock up the goodies". That's exactly what The Chastity Belt Bra does - it comes with a little gold key that the wearer can present to her guy of choice. Rather romantic, come to think of it. So why is actress/singer/model Aya Ueto acting so, er, horny? And there you have it, the Best 8 Bizarre Bras from Triumph International Japan. Yes, there have been others and there will be more. As long as there's a cause worth hyping or an issue in need of wider awareness, Triumph will be there... Bra-vo!!! Nice bras you picked there, Steve!